Article looking at the position of 'Oriental Jews' (i.e. those from other countries in the Middle-East) within Israel and the zionist project historically. I shall try to describe, in three parts, several aspects of the relationship between zionism and the Oriental Jews. First, I shall discuss those ideological contradictions which have determined zionism's con­ception of its Oriental subjects. The second part will deal with the socio-economic realities of Israel: poverty; rural and urban slums; industrial proletarianisation; policies in housing, education and demographic planning; the character of discrimination in everyday life. Finally, I shall discuss some components of the ideological and political superstructure which developed among the Oriental Jews, as a result of their social reality and as a reaction to the zionist conception of them: a crisis of identity, the breakup of communities and of their traditional elites, self-repudiation, political attitudes, the development of some measure of class and group consciousness and, from that, limited revolt. Zionism claims to speak in the name of all Jews, but in fact it is a movement which emerged in the Ashkenazi (Central and Eastern European) communities, and has never embraced any other part of world Jewry. Of course, some form of religious longing for 'Zion' as a symbol of messianic apocalypse and of religious pilgrimage has existed in most Jewish communities; but one should not be misled into identifying this spiritual symbolism with the Ashkenazi movement of political zionism. European anti-semitism has tragically imposed on Europe's Jews successive changes in the bases of their existence, mainly by migration or, when possible, by assimilation. In addition to these two spon­taneous processes, modern anti-semitism has generated two organised Jewish reactions: on the one hand the Jewish Bund, a part of revolutionary social democracy, which struggled for the autonomy of East European Jews on the basis of their actual language and culture, in the framework of a future socialist Europe; and on the other hand the zionist movement, which crystallised under the influence of the general drive towards self-determination, headed by the national bourgeoisies of central and eastern Europe. Thus, zionists regarded their movement as the perfect embodiment of Jewish political self- determination. The concept of self-determination applies to situations where a group struggles to achieve an independent political structure that may enable it to express freely its existing character. This is a purposely broad definition, which encompasses legitimate as well as dubious forms of national, linguistic, religious or racial separatism. However, zionism has no place even in this loose framework (although the Bund does). The zionist movement had set itself the aim not to express Jewish reality but totally and radically to reshape it. This is the very opposite of self-determination: it is a form of transcendental self-definition. The elements of an authentic move­ment for self-determination are replaced in zionism by archaeological realities of the 'ancestors', as conveyed by religious texts. The zionists' fascination with archaeological excavations is well known. The Ashkenazi zionists have always had a profound disdain for their European origin. They scorn 'the diaspora mentality'. The vanguard of zionism, especially before the compromise urged by Berl Katsnelson in the 1930s, wished to transform the nature of the Jewish community down to the last detail: absolute atheism, Hebrew in place of Yiddish, manual labour instead of trade and the liberal professions. As opposed to this self-repudiation, the realities of zionist self-­reconstruction were very much in the spirit of nineteenth century national movements in Central Europe and the Balkans, where rival historical claims to territory were vehemently exchanged between virtually any two neighbouring nationalities. However, while the silly 'historical' irredentist claims were an appendage to genuine demands for these national movements, the zionist 'historical' claim was the indispensable core of the whole zionist enterprise. This basic contradiction then, between a claim of self-determination and an actual self-repudiation, was followed by a transcending ar­chaeological redefinition of self. This has cast its shadow over all aspects of zionist existence. Its first implication is this: if the basis of your self-determination is not your actual self but some ar­chaeological 'other self', then you also 'self-determine' all other people who happen to bear the same relation as you to that ar­chaeological entity, even though they may be totally alien to you. Specifically, since the zionists took their assumed common descent to define themselves as a 'nation', it followed that all descendants of the same ancestors were to be included. To be sure, this did not mean that they rushed to invite representatives of the Oriental communities to take part in their frequent congresses – for the obvious reason that they had little in common with them. But the idea was there. And when the need arose, zionists did not even consider including Palestinians in their national enterprise, but rather chose to manipulate other Jewish communities, some of whom (such as Indian Jews from Cochin and Jews from the Moroccan Atlas mountains) were much more foreign to them than the Palestinians. It should be understood that religion has played only an indirect role in defining the 'Jewish nation'. The religious definition of a Jew is in effect ethnic: a Jew is anyone – even if an atheist – born to a Jewish mother, or a person officially converted to Judaism. The number of conversions to Judaism throughout history is, supposedly, negligible, which is why religion has been used by atheist zionists as an excellent test of what really mattered: being a descendant of the an­cestors (There was furious zionist reaction to a recent book by Koestler1 which asserted that millions of European Jews are descendants of the massively converted Khazar population of medieval southern Russia). It should be noted that non-Ashkenazi Jews on the fringe of the Ashkenazi world, in Greece, Serbia and Bulgaria, did take some part in the zionist movement. An example is David El'azar, chief of general staff during the 1973 war, who was a Sephardi from Serbia. His father, on the other hand, was not a zionist, and refused to leave Yugoslavia. The Jewish state embodies the concept of 'Jewish national unity' which, though fictitious, is a necessary postulate of the zionist movement. Contrary to common belief, there are not just two Jewish communities, Ashkenazi and Sephardi. These large groups may be sub-divided, but more importantly, they are only two in a much longer list of communities. From a religious point of view, there are five main groups, corresponding to five variants of Jewish liturgy – German (Ashkenazi), Spanish (Sephardi), Italian ('Roman'), Iraqi (Bavli) and Yemenite. Of these, the first two had their own languages – Yiddish (a Middle Rhine German dialect) and Ladino (a mediaeval dialect of Castilian). In addition, there are communities that fall outside these five main groups. Among them are the large Moroccan community (who speak Arabic or Berber); the large Aramaic-speaking Kurdish community; the large Persian community (whose language is not modern Persian but a medieval Iranian dialect) and the Jews of Cochin in southern India. The linguistic cohesion of a community is usually only one of several characteristics, developed under the impact of the surrounding culture, though not in unison with it: folk music, dances, plastic arts, tales, humour, dress, cooking, style of family life and so on. In addition to these cultural differences, the physical ethnic dif­ferences between the various communities are also striking. All communities were affected by periods of intermarriage with the surrounding population. However, some communities are probably the direct result of organised conversion; on historical evidence, this is quite likely in the case of the Yemenites (a Jewish kingdom existed in Yemen in the fourth century), the Falashi Jews of Ethiopia (who seem to be converted Amhiras) and the Jews of Cochin. All these are ethnically indistinguishable from their unconverted compatriots. The many differences between the various Jewish communities led to mutual discord, once they had settled in Israel, aggravated by a strong clannish spirit within each group. As they were subjected to some form of discrimination in each host country, Jews developed strong feelings of kinship with their own kind, and fear and suspicion of others. In many cases this kinship was highly structured and organised; in regions such as Iran and the remains of the Ottoman Empire, where a large number of nationalities coexisted under a despotic state, the structured community and sub-community (clan, hamoula) were a basic form of social organisation. Roughly speaking, the greater the cultural and ethnic differences between two Jewish communities, the more noticeable was their mutual hostility in Israel. However, violent clashes occurred in the 1950s even between various Oriental communities, when these were placed close to each other. This was a great surprise to the Ashkenazim, who would lump all non-Ashkenazi Jews together under the label Sephardim (since the Sephardi community was the only non­Ashkenazi one known to them from Europe). Following several riots, the different communities were settled separately, in ethnically homogeneous geographical units (rural colonies or urban neigh­bourhoods). The frequently brandished slogans about 'the melting pot' and 'the merging of the nation' had become mere fiction. Of course the greatest hostility existed between the Ashkenazim and the rest. The Ashkenazim were the ideologically – and eco­nomically – dominant half of the Jewish population, which manipulated the other half in a spirit of paternalism mixed with contempt. Being frequently called 'schwarze' (black) and 'frenk' (pejorative for Sephardi) by Ashkenazim, the Orientals retaliated by calling them 'vusvus' (from the Yiddish word 'vus', meaning 'what'). Violent outbreaks of hostility were usually confined to individual cases such as an assault on an Ashkenazi official in his office, or on an Ashkenazi foreman in the workshop, since the geographical separation between Ashkenazim and Orientals was usually sufficient to prevent riots. Nevertheless, the few exceptions are significant. For instance, the Moroccan Jews who were settled in the formerly Arab quarter of Wadi Salib in Haifa, rioted in 1959 in the Ashkenazi part of the city. The 'Jewish state' of the 1950s was a state of distinct cultural and ethnic communities. Since then, the organised and coherent com­munities have disintegrated under the impact of new socio-economic realities, and the Jewish population has gradually moved towards a clearer dichotomy – Ashkenazi versus Oriental. But the earlier situation has helped to create an atmosphere of ethnic hostility and levels of segregation and discrimination which mark Israeli society up to the present time. The early zionists were really worried about only one con­tradiction – between the largely middle-class composition of the Jews and the need of zionism, like any national enterprise, to have a working class at its disposal. For rather complex historical-economic reasons, Jews had been concentrated in non-productive occupations2. True, late in the nineteenth century, a part of the Jewish population of East Europe, mainly in southern Russia and western Poland, underwent a profound process of proletarianisation, while another group settled down as farmers3. However, this section was still comparatively small (especially in the zionist centres of eastern Poland, Lithuania, Galicia and Bessarabia) and gave its political support to the anti-zionist Bund movement. A form of charity zionism (which preceded political zionism) did actually base itself on the middle class composition of the Jews. When, in the second half of the nineteenth century, the small and prosperous Jewish communities of western Europe began to worry about the stream of Jewish immigrants from the East, the French Baron Benjamin Edmond de Rothschild ('the charitable') initiated a project to divert this stream to Palestine. He tried to settle East European Jews on lands bought by him, where they were to become farmers employing native agricultural workers, somewhat like the French colons of Algeria. This project failed: ideologically, it had little national attraction, and in individual terms it seemed to an East European Jew much more sound, and more promising, to emigrate to the New World or western Europe than to the Ottoman Empire. While praising the Rothschild project for pioneering the 'Jewish return to the land', the early zionist activists criticised its inadequacy as a national program. Their own response to the class contradiction mentioned above was in the way they rejected their identity as European Jews: they tried to transform themselves into manual workers, and, as a central element in their endeavour, completely to reverse and reshape the form of Jewish existence. The early ideologists of 'left zionism' defined as the main target the 'inversion of the Jewish social pyramid': Jews were 'abnormally' concentrated in the higher and non-productive strata of the social spectrum, and the task of zionism was to create a 'normal' population with a majority of manual workers. Consequently, the young zionist immigrants organised themselves into work brigades which engaged in early collective colonisation (in eastern Galilee and the Judean plain) as well as in wage labour for Jewish farmers in the older settlements. It was indeed important not only to form new settlements, but also to integrate the existing Jewish colonies into the zionist project. This movement was verbally dramatised to sky-high proportions. A kind of pseudo-marxism was combined with romantic Tolstoyan mysticism to create the 'Religion of Labour' of A. D. Gordon, which idealised manual labour, especially in agriculture, as a supreme purification of man. The young idealists, mostly of lower middle class origin, regarded themselves as martyrs of the new religion. However, few of these early idealists could stand the hardships of toil and the inhospitable climate. Of the first wave of pioneers around the turn of the century (the second aliyah) about 90 per cent went back to Europe. Those working for Jewish employers could not compete economically with the Arab workers, who were used to the climate and to manual labour, and were being paid derisory wages. The zionist project seemed to be doomed. In fact, once the quota of hands immediately needed by Jewish farms had been filled, the Palestine Office decided to stem the influx; Yavnieli had been 'too successful'. Instructions were therefore despatched to Yemen that no more Jews should be sent to Palestine 'until further notice'11 - that is, presumably until Ashkenazi zionism would need more hands. The new prospects, coupled with the growing anti-semitic threat in Europe, made zionism more popular among Jews in Europe, and the volume of donations increased. This enabled the Jewish Agency (which was, in effect, the Palestine branch of the zionist movement) to buy large tracts of arable land from Arab landowners, mainly in the fertile valleys and coastal plain. The Palestinian tenants were evicted, often with the aid of British forces, thus freeing the land for Jewish colonisation. This was followed by scattered acquisition of lands all over the country. The vanguard of zionism realised that its very project depended on an actual occupation of lands by agricultural labour. Furthermore, it was important to spread the new settlements all over Palestine, so as to stake out a claim to the entire country. Being better prepared, organised and financially supported, and having more land per settler, the new colonisers succeeded where their predecessors of the second 'aliyah' had failed. It should be realised that the ideology of manual labour had by now been severely modified, and become much more pragmatic. Labour ceased to be regarded as an ideal in itself, around which the 'reborn nation' would crystallise. It became an instrument in building up a political enterprise in the midst of a hostile indigenous population. But only certain kinds of labour were useful for this purpose – in agriculture and in the strategic nodes of the country's economy: the ports, the railways, the oil refineries. Contrary to a widespread belief fostered by propaganda, only a small minority of the Jewish population in British-ruled Palestine was rural. In 1948, about 85 per cent lived in the three urban centres. Also, among the urban population only a small proportion was engaged in manual labour, mainly in small-scale manufacture, crafts and housing construction. However, the rural minority together with a tiny urban labour aristocracy, being the vanguard and the driving force of the zionist enterprise, constituted a highly respected social elite, to which practically all the leaders of the movement belonged. The fundamental class contradiction remained totally unresolved. While most Jews in Palestine were still engaged – just as in Europe – in commerce, services and administration, a vanguard elite minority was proudly performing those kinds of manual labour which were necessary for the capture of strategic positions (The same minority would, in later years, also produce the military leadership of the state). Of course, someone had to do the 'dirty jobs' and the more strenuous work in the Jewish towns. An answer to this problem was at hand: the agitation in Yemen was renewed, to provide the necessary labour force for the low-status jobs, such as seasonal agricultural work and personal services. The expression 'my Yemenite', used by Ashkenazi women, was synonymous to 'my housemaid'. To get Jews to perform strenuous stevedore jobs in the strategic port of Haifa, the zionist movement successfully recruited immigrants among the Sephardi Jews working in the Greek port of Salonika. When the 1948 war broke out, zionist propaganda projected the image of a normal, self-sufficient nation, ready for independence. The reality was quite different. Only a small part of the food consumption was supplied by the Jewish agricultural settlements, since this occu­pied only a relatively small proportion of the arable land in the gener­ally arid country, and many of them had mostly strategic rather than agricultural value. There was only a very small industrial working class, since the industry was mostly rudimentary.14The strategic infrastructure had been only partly damaged, but it served little purpose after the British had left. In short, this was an unproductive society, with a highly glorified appendage of a few dozen kibbutzim. The class contradiction in the newborn state of Israel was still to be solved. The slow development of a capitalist industry proper, started in 1958–59, finally created a need for a genuine industrial proletariat. 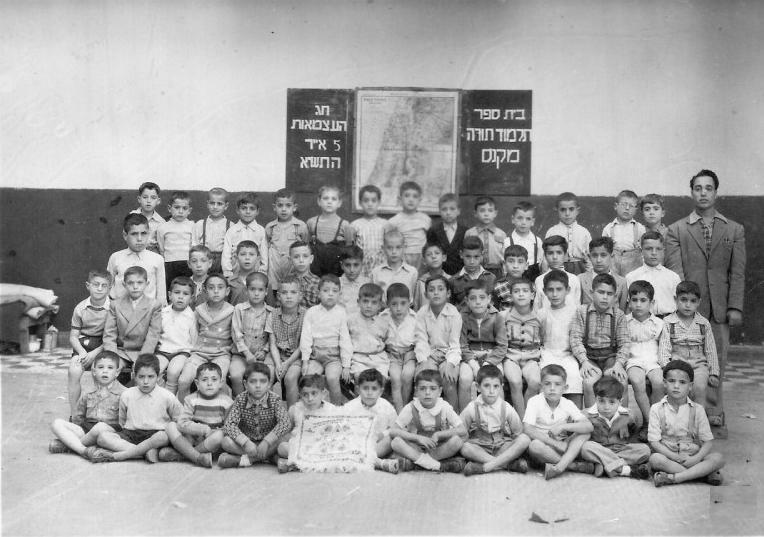 Most of this class, especially its lower and middle layers, was recruited from the Oriental Jewish population. Clearly, there is a fundamental difference between the bureaucratic and authoritarian deployment of Orientals for forced colonisation from 1949–55, and the proletarianisation of these communities since the late 1950s. The social mechanism regulating the latter process is that of a free labour market, in which social discrimination assumes a more mediated, impersonal and diffuse form. This difference may be roughly compared with the difference between the early coercion of blacks into slavery in the US South, and subsequent discrimination against them in the industrial centres of the North and Midwest. existence. From the start, Oriental Jews were a passive entity for zionism, there to be led to salvation by the Ashkenazi zionist movement. Culturally as well as ethnically they were quite distinct from the Ashkenazim. The large-scale manipulation of the Oriental Jews has consisted of two stages: immigration and colonisation. We have already mentioned the cynical messianic propaganda conducted in Yemen by atheist zionists. However, such methods could work well only when applied to socially archaic communities (Yemen, Bukhara, Soviet Uzbekistan, Kurdistan). A more widely applicable method of propaganda consisted in making the most fantastic material promises about the future awaiting the prospective im­migrants in Palestine, including assurances that many brilliant opportunities were in store for all artisans and craftsmen, who con­stituted the majority of the labour force in some communities. This method was widely used in North Africa, Turkey, Syria, Kurdistan and Persia. However, these propaganda methods would only have had partial success but for the fact that the Oriental communities themselves were under crisis. Whatever wishful thinking is expressed by Palestinian spokesmen, Jews, along with other religious, ethnic and national minorities, were discriminated against in large parts of the Moslem world – though, to be sure, not in the same way and to the same extent as in Europe. The constant rise of Arab nationalism greatly intensified the discrimination against minorities in the Arab world. This was strongly felt, for example, by the Copts in Egypt and the Berbers in the Maghreb. A severe blow to the welfare of Jews in the Moslem world in general, and in the Arab world in particular, was the zionist enterprise itself. As they developed an anti-imperialist consciousness, the nationalists in the Moslem countries were constantly being told of the organised settlement of European Jews in the very heart of the Arab world and around the second Holy Place of Islam, under the protection of an imperialist mandatory power. The recurrent violent clashes between the zionist movement and the Palestinians (1922, 1926, 1929, 1936–39, 1947–49) were perceived as massacres of Palestinians – and Palestinian victims were indeed far more than Jewish ones. Among the Moslems lived the co-religionists of those aggressors, people whom zionists claimed to be their fellow nationals. Jewish community leaders were repeatedly requested to clarify their stand on the issue of zionism and to voice opposition to it; but when they did this they were suspected of disingenuousness. The resulting discriminatory pressure was an important factor in increasing the receptiveness of Oriental communities to zionist calls for emigration (Thus Syria 1946, North Africa 1950–52, Egypt 1956, Algeria 1958). Nevertheless, in some cases even this discriminatory pressure, though combined with zionist religious calls and material promises, was not enough to provoke a large exodus. This was mainly the case with the more educated and integrated communities, like those of Baghdad and the cities of Morocco. In these places Jews held higher socio-economic positions, while many of them participated in the local left-wing and nationalist movements. The case of the Baghdad community is especially noteworthy. Zionism had never succeeded in becoming a focus of attraction for the Jews of Iraq even after 1948. While a section of the Baghdad community consisted of wealthy merchants and bankers, a large part of the Jewish youth adhered to the communist party. Even many of the party's leaders were Jews. According to a zionist historiographer23 a zionist meeting organized in 1946 was attended by three dozen people, while the Jewish Com­munist Anti-Zionist Alliance was publishing a daily paper in Baghdad, printing 6,000 copies a day. During the period 1949–55 the Jewish population of Israel increased by a whole million, from about 600,000 to about 1,600,000. Only about one half of the million new immigrants were homeless survivors of the Nazi holocaust, but even this half already constituted a huge immigrant intake in comparison with the size of the veteran population. Nevertheless, zionist policy increased the number to a full million with the Oriental immigration. This cannot possibly be ex­plained as a humanitarian rescue operation; it cannot be maintained in good faith that the Oriental Jews, organised into flocks of im­migrants, were facing imminent danger throughout the Moslem world. What remained of the Yemenite community, as well as the communities of Iran, Morocco and Cochin (to mention but a few) were in no such danger. This haste in organising the Oriental immigration caused un­necessary hardship to both Oriental and Ashkenazi immigrants. It is worth adding a few words here about the reason for it. The Israeli government had a very weak claim over those areas controlled by its army in 1949 which exceeded the territory allocated to the Jewish state in the 1947 UN partition plan – a plan that the zionist leadership had verbally accepted. The claim was weak both in practice and in international law.26 Ben-Gurion's policy, aimed at consolidating that claim, consisted of two mutually complementary elements: on the one hand, military stabilisation of the armistice lines into de facto international borders; on the other hand, massive colonisation of the territories inside these lines. Here, 'military stabilisation of the lines' does not mean sealing them against intrusion of regular enemy units – the danger of such in­trusion did not exist in 1949–53, and the Israeli army could be greatly reduced by demobilisation during that period. The aim was rather to seal the lines against the Palestinian peasants massed in refugee camps just on the other side, who persisted in their attempts to cross over, to return to their homes, or at least to work their fields (usually at night) on the Israeli side. The job of preventing this could largely be per­formed by the existing structures of the Ashkenazi vanguard. A chain of armed kibbutzim was established along the armistice lines, manned by the zionist-socialist youth movements, who, during the 1948 war, had provided the most devoted and socially coherent military units, the Palmach. During the immediate post-1948 period, the ideological pressure on the Ashkenazi youth in the cities was very strong. A youngster who did not join a pioneering youth movement and did not wish to settle in one of the frontier kibbutzim was made to feel a traitor to zionist ideals. However, the massive occupation of the new territories was of even greater importance. The UN repeatedly required Israel to allow the repatriation of the Palestinian refugees, regardless of any final arrangements of peace and permanent borders.27 Of course, a massive repatriation of Palestinians was inconsistent with the existence of an exclusive Jewish state within the expanded borders. However, strange as it may sound now, the principle of an exclusive Jewish state had never been accepted by any part of the international community. Thus, according to the 1947 UN partition plan, the Jewish state (whose area was to be 14,000 km2 rather than the 20,000 km2 which Israel occupied by 1949) was to have 403,000 Palestinian Arabs living in it as equal citizens. Conceivably, the filling could have been done with the large number of new Ashkenazi immigrants. But in practice this was not feasible: these immigrants were not easily manipulable, nor did the zionist establishment itself show any wish to manipulate them.29 Most of them had relatives, old acquaintances and friends, both among the veteran Israeli Ashkenazim and abroad. They were seen by the establishment as they saw themselves – as individuals. If they were forced to face harsh living conditions without a prospect of rapid improvement, they would re-emigrate to Western Europe, the US, Canada or Australia – as indeed hundreds of thousands of them have done in any case. The only really manipulable element were the Oriental Jews, and their precipitate immigration was organised for this, and only for this reason. Total strangers in the country, unable to go back, waiting to be guided in their next steps into a destiny over which they had totally lost control, they were gathered in the sparsely populated strategic regions. Behind the chain of kibbutzim strung along the armistice lines, as many as 214 rural settlements (moshavim) were set up between 1949 and 1955, with a total population of 70,000, of which (in 1960) 78 per cent were Oriental (The remaining 22 per cent of Ashkenazim were settled in very different conditions). The settlers were allocated small plots to farm – about one tenth of the arable area per capita that was allocated to the Ashkenazi settlers in the 1930s. The forced colonisation through the Oriental Jews is a story of years of great suffering, humiliating discrimination and bleak frustration. According to zionist doctrine, Israel is defined as 'the state of the Jewish people'. This definition is unique – a state which is not the state of its actual citizens but of a group (the Jewish people) of which its citizens are a minority, and to which only part of them (the Jewish citizens) belong. According to the famous Law of Return, any Jew has an automatic right to become an Israeli citizen upon entering the country. For that matter, even this condition may be waived, and on several occasions Israeli citizenship was actually offered to Soviet y Jews while still abroad. Zionist doctrine still demands that a genuine zionist must emigrate to Israel, but one can well imagine that, should the need arise, the Israeli government would grant Israeli citizenship wholesale to all Jews abroad who are willing to accept it. By this means, even if the Palestinian citizens of the state ever came to outnumber its Jewish inhabitants, zionism could still remain in power as representing the 'democratic majority' of all citizens. The victims of this particular practice of the Israeli state are not only the Arab citizens, who are constitutionally of lower rank, but also the Oriental Jewish citizens. If Israel is the state of all Jews, then it must be an Ashkenazi state – since the overwhelming majority of world Jewry are Ashkenazim even though Oriental Jews are majority in Israel itself. Thus the impotence of Oriental Jews in Israel is not just a historical outcome of various socio-economic ideological factors, but an integral part of zionist legitimation. This is not a quibble; the point has serious material and psychological implications. The ties with the zionist section of the Jewish diaspora is vital for the zionist enterprise, politically, economically and financially. The Israeli establishment makes every effort to charm European and American Jews, to mobilise them, to squeeze them, to organise them, to teach them, and to save them from the horrible fate of assimilation. Contradicting their previous repudiation of their identity and disdain for the diaspora mentality, the Israeli leaders are ready to support the most aggressive form of medieval clericalism, the Habbad Hasidic sect, and they even try to revive Yiddish language and culture – the very language and culture they themselves had once spurned. To take one somewhat grotesque example: in Jerusalem a couple of years ago, several hundred Zionist activists from the US gathered for a 'congress of Yiddish writers' – amoribund species. They were addressed by the president, the prime minister and the minister of education – a triple honour that congresses of Hebrew writers have not been treated to for many a year. The education syllabuses in Israel are changing in the same direction: at all levels, growing emphasis is put on Jewish Ashkenazi culture. Ashkenazi supremacy in Israel is reinforced by the Zionist state's need to present to the influential and wealthy Ashkenazi communities abroad an image with which they can easily identify. From this point of view, Oriental Jews are bound to be considered a minority in Israel; in fact they now slightly outnumber the Ashkenazim, but even if they should outnumber them two to one or ten to one, they will still be a 'minority group' as far as the zionist leadership is concerned. The Oriental Jews are victimised not only by the reference to world Jewry as the defining constituency of the state, but also by the exclusion of the non-Jews. This exclusion establishes a constitutional segregation between distinct categories of citizens. But once exclusion is made, it establishes a norm which affects all aspects of the relations between the state and its citizens. A hierarchy of citizenz is established: the Arabs are categorised into sedentary Moslems, Christians, Bedouin, and Druse (in ascending order). For instance, a sedentary Moslem will under no circumstances be enlisted into the Israeli army, even if he wishes to be (there have been such cases); a Christian may be, if he volunteers; Bedouin of certain tribes and all Druse are conscripted (Druse conscientious objectors have been imprisoned). Continuing this hierarchy upwards, hardly any Jew has ever achieved in his military career one of the top four military ranks33. To take an example from another sphere: Ashkenazi Jews were settled in the 1960s in 'Arad, a promising new town with independent economic resources; but at about the same time Orientals were being settled in Migdal Ha'emek, a new town without an economic base. Non-Jews are not allowed to create any new village or town;34 however, when the Jewish town of Eilat recently needed hands for some rough service jobs, several dozen Druse were 'brought' there (this term was used by the Israeli press). The way citizens are stratified into six categories (the four categories of Arabs already mentioned, plus Oriental Jews and Ashkenazim) is evident everywhere in Israel. Recently, one of the Druse notables earnestly begged the Israeli government to treat his community on a par with the Oriental Jews; not with 'the Jews', since these do not constitute a single category in the hierarchy; and not with the Ashkenazim, since that would be asking far too much. Like many other nationalist movements, zionism has tended to develop a fetishist attitude to the state; the state is regarded as an entity for its own sake, whose subjects exist to serve it and contribute to its glory, not to be served by it. This ideology is expressed without reserve by a great number of Israelis. There are a number of factors, peculiar to zionism, which have particularly encouraged this worship of the state. First, the organisation of the processes of immigration and colonisation gave rise to a huge bureaucracy, accustomed to manipulating large population groups. Secondly, the constant conflict with the Arab world has tremendously boosted the prestige and power of the military; a large and growing part of the social, bureaucratic and political elite is made up of retired generals. In addition, a kind of collective paranoia has developed among large sections of East European Jewry, as an understandable result of a long history of discrimination and pogroms, culminating in the horrors of Nazi extermination. The state crystallises their instincts of fear and defence, which have further developed as a result of the continual state of war. Early zionist leaders were also driven to a despotic view of the state by their experience in their countries of origin – Tsarist Russia, the Austro-Hungarian Empire, fascist Poland, Romania and Hungary of the inter-war period. These moderating factors were, nevertheless, only partly effective, and in any case less relevant to the relation of the state to the Oriental communities, than to the formal state institutions and their relations to the Ashkenazim. Worship of the state was therefore one of the major ideological elements that have facilitated the rough manipu­lation of the Oriental Jews. However, state fetishism affects the Oriental subject on a personal level as well. Whatever aid or service he receives is considered as charity, not a state obligation, and the zionist establishment is very proud of itself for it. Also, young Ashkenazim have been repeatedly encouraged and organised to do charity work among Orientals, as a substitute for the sorely needed improvement of the derisory public services and the deficient education system. In this and similar ways, charity and paternalism govern all aspects of the relations of the zionist establishment to the Oriental Jews. The same attitude is also expressed in an inverted form in the Ashkenazi grudges against the Oriental Jews (as well as against Israel's Arab citizens and even the population of the occupied territories). Since public aid and services are felt to be dispensed as charity rather than obligation, any complaint of the receiver is regarded as ungrateful. There is absolutely no feeling of guilt in the zionist establishment for its cynical manipulation of the Orientals. On the contrary, it is very proud of having raised them slightly above the rest of the despised Orient. This outlook is conveyed in frequently used expressions such as: 'We are the ones who have built up the country, so that they may come and enjoy it', 'When have they ever had such a high standard of living before? ', 'Who ever would have treated them so well?'. After her single meeting with Israeli Black Panther activists, Prime Minister Golda Meir had only this to say: 'Once they were nice kids, and I hope that among them there are still some nice kids, but some of them, I'm afraid, will never be nice kids. '39 These words became, for a number of years, a symbol of Ashkenazi paternalism, which does not accept any Oriental grievance as legitimate. In his programmatic book The Jewish State (published in 1896) Theodor Herzl, the founder of political zionism, made the following promise: 'For Europe we shall serve there [in Palestine] as a bastion against Asia, and be the vanguard of civilisation against the bar­barians.' This idea, a leitmotif of zionism since its very beginning, was quite natural. Like any other colonising movement, zionism needed the backing and support of an imperialist power. However, whereas most colonial movements were generated in the first place by some specific imperial power as part of a particular colonial venture, and were therefore automatically supported by the sponsoring power, zionism was created by an independent dynamic and was therefore seeking the sponsorship and support of 'the West' as such – ie of imperialism in general. Consequently, zionism's antagonism towards the Orient was more part of its character, and hence more radical and complete, than one normally finds in colonial movements. Of course, the link with imperialism could not remain abstract. It had to be cemented by specific alliances. Herzl started by seeking the patronage of the German Kaiser. Then, from 1915 to 1939, there was a long and fruitful alliance binding zionism with British imperialism. This partnership was broken by the British when they began to see it as more of a liability than an asset. This also turned out to be in the long term interest of zionism, which was then free to forge an alliance with American imperialism, the new master dominating the Middle East40, and to obtain vital (albeit short-lived) support from the USSR (which, like the US, was seeking to accelerate the disintegration of Britain's Middle East empire). The zionists' conflict with Britain also enabled them to appear as politically independent and indeed as 'anti-imperialist' during a crucial period of history. Thereafter – notwithstanding a flirtation with moribund French imperialism, culminating in the Suez affair of 1956 – zionism has remained attached to its American patron. Zionist devotion to the West has not abated with time – quite the contrary: Israel has never ceased to proclaim that it is not only 'western' in character but is actually part of Europe. As a matter of fact, Israel does belong to the European sections of various in­ternational organisations, such as sports bodies and Unesco. Like all colonisers, zionists have developed deep contempt towards the 'natives'. A whole pattern of prejudice against the 'Arab mentality' has been created, sometimes by projection of anti-semitic themes: the Arabs are two-faced, cowardly, dirty, lazy, crafty, noisy, and so on. This racism has been extended to apply to the whole Arab world, and to the Orient in general. In addition, a zealous cult of technology has emerged in zionism, fostered by the capitalist character of the state of Israel, fuelled by the worship of weaponry, and fanned by the abstract admiration for the West and its technological culture. The Orient is despised all the more for its inability to master western technology. The contempt in which the Israeli Ashkenazi elite holds the Orient is reflected in a very conscious and explicit way in its attitude towards the Oriental Jews. From the very first contacts, Ashkenazi prejudice has despised them for being 'black', 'uncivilised' and, generally speaking, similar to the Arabs. According to a widely told story which is regarded as very witty, Bialik, the zionist national poet, used to explain that he disliked Arabs – because they were so like Oriental Jews. This aspect of discrimination against the Orientals is evident especially at the level of the educated elite. Oriental Jews are not entrusted with positions of real power in civil or military bodies. The few high ranking non-Ashkenazi officials are either in powerless, ornamental, or representative positions, such as Chairman of the Knesset; or they are Sephardim, who are not really Orientals, in the most minor cabinet posts. The better educated an Oriental Jew is, the worse is the discrimination to which he is subjected. This last assertion is based, among other sources, on the statistical data in the official report of the Horowitz committee, nominated in 1971 by Golda Meir in order to 'investigate' and confirm the official explanation for discrimination against Oriental Jews – their lower level of education. If this explanation were correct, then the gap between Ashkenazim and Orientals in Israel should gradually be narrowing. But in fact 25 years after the mass immigration, almost 100 years after the arrival of the first Yemeni Jews, and in spite of some efforts at integration by the zionist establishment, the social, economic and educational gap is as wide as ever, and remains a central internal contradiction of Israeli Jewish society. 1. A. Koestler, The Thirteenth Tribe: the Khazar Empire and its Heritage. Random House, 1976. 2. Cf Abram Leon, The Jewish Question. a Marxist Interpretation, Path­finder,1970. 3. Trotsky's father was one such farmer. 4. Quoted in Alex Bein, History of Zionist Colonization, 4th ed, Massada, 1970 (Hebrew), p97. 5. A. Bein, op cit, p98. 7. A. Bein, op cit, p99. 8. A. Bein, op cit, p98. 9. A. Bein, op cit, p101. 10. Ahad Ha'am, Collected Works, Jewish Publishing House, 1947 (Hebrew), p426, n.
11. A. Bein, op cit, p101. 12. Nadav Halevi and Ruth Klinov-Malul, The Economic Development of Israel, Bank of Israel\Praeger, 1968, p25. 13. During 1924-31, about 82,000 immigrants arrived in Palestine, and the Jewish population there roughly doubled, reaching 174,000. During the 1930s, about 217,000 immigrants arrived and the Jewish population reached 450,000. See N. Halevi and R. Klinov-Malul, op cit, ppI5-17. 14. Even in 1945, at the end of the war boom, when the Jewish economy was protected and enjoyed a large market (the British army), only 31.8 per cent of the Jewish labour force was employed in industry (mostly as individual ar­tisans or workers in small-scale manufacture). By 1947, the figure had declined to 26.5 per cent. See N. Halevi and R. Klinov-Malul, op cit, p25. 15. See Hanegbi, Machover and Orr, 'The class nature of Israel', New Left Review, 65,1971, pp7-9. 16. Cf §§4, 5 below. Until the end of 1951, the Jewish Agency paid the costs of all Jewish immigrants (including their fare to Israel as well as costs of improvised shelter, food and other vital needs during the first few months after arrival). From November 1951, financing of immigrants became more selective. In general, except in 'rescue' cases, the Agency would finance the immigration of a group of Jews only under the following conditions: 'Eighty per cent of immigrants must be between the ages of 15 and 35, or skilled workers, or owners of at least $10,000 worth of capital; unskilled workers are required to agree in writing to work at assigned jobs for two years after immigration.' (Jewish Agency Immigration Papers. No 20, quoted in Halevi and Klinov-Malul, op cit, p55). 17. Cf Halevi and Klinov-Malul, op cit, p30. 18. Cf Hanegbi etc, op cit, and M. Sneh, The Israeli Economy, CC of the Israeli CP, 1960 (Hebrew). 19. Quoted in Sneh, op cit, p11. 21. Quoted in Mesilla, Histadrut Publishing House, 1924 (Hebrew), p43. 23. A. Ben-Ya'akov, History of the Jews in Iraq, Jerusalem, 1965 (Hebrew), p257. He also writes about zionist emissaries who were imprisoned, and were greatly astonished and embittered by the refusal of Jewish communist fellow ­prisoners to associate with them. Similar information is given by Grodzenski in an article 'Two cultures' in Davar, 4 June 1970. 24. This is confirmed by many witnesses. A detailed account was published in Ha'olam Hazeh, 20 April 1966 and 1 June 1966. 25. Uri Harari, 'Our responsibility towards the Jews in the Arab countries', in Yedi'ot Aharonot, 9 February 1969. 26. Cf N. Weinstock, Le Sionisme contre Israel, Paris, 1969, pp410-424. 27. Resolution 194 (111) of the UN General Assembly, 11 December 1948. This was reiterated in numerous subsequent UN resolutions. 28. A. Assaf, The Moshav Ovdim in Israel, Tel-Aviv, 1953 (Hebrew), p178. 29. A significant exception to this were the Jews from the rural parts of Romania, who were not zionists, did not speak Yiddish, and were treated almost on a par with Oriental Jews. 30. Bank of Israel Annual Report for 1963, Jerusalem, 1964 (Hebrew), p15. Strictly speaking, the figure of 71 per cent refers only to the immigrant population of these towns. A quarter of the inhabitants were in fact Israeli born – mostly young children of immigrants. Since the birth rate among Oriental Jews is far higher than among Ashkenazim, the proportion of Orientals among the total population must have been 75 per cent at the very least. The Ashkenazi 25 per cent were largely made up of officials and their families. 31. Ibid. The term 'desolate' here refers not only to areas that were actually depopulated through the expulsion of their Palestinian Arab inhabitants, but also to areas that still had a dense Arab population. Thus the Bank's statistics include the 'development town' of Upper Nazareth, set up next to the crowded Arab town of Nazareth as part of the project of 'Judaization' of Arab-populated Galilee. 33. One ostensible exception, Gen David El'azar, was a European Sephardi (see § 1 above). 34. A bizarre episode occurred during the 1950s. Several groups of Arab youth were recruited by the 'left' zionist party Mapam, educated in kibbutzim and indoctrinated with the movement's 'pioneering values'. However, in 1958, when the young Arabs wanted to practice what had been preached to them and to found a new co-operative farm, they discovered that land was only allocated for Jewish settlement. See Y. Netzer and T. Raz, The Pioneering Youth Movement initiated by Mapam – a Topic in the History of Israel's Arabs, Shiloah Institute, Skirot series, Tel Aviv, May 1976 (Hebrew). 36. In recent years the situation has changed somewhat: the extent of Israel's eventual withdrawal from the occupied territories is a serious issue on which the zionist camp is indeed divided, though the present division to a great extent cuts across the old party lines. This seems to be the reason for the recent acceleration in the move towards a 'strong state'. It did not occur earlier precisely because of the ideological uniformity of the system. 37. That is, relative to the low productivity of the economy. See Hanegbi, Machover and Orr, op cit. 38. However, by now this hope has practically evaporated in any case. Also, the most militant zionists in the US are now themselves moving towards support of a 'strong state'. 39. See, for example, Yedi'ot Aharonot weekend supplement 28 May 1971. 40. 'In those very years of struggle [with Britain] there occurred a process of a beginning of a new attachment: America-Zion instead of England-Zion – a process that relied on the fact of US penetration into the Middle East as a decisive world power.' (This is an assessment by the veteran Labour zionist political commentator Michael Assaf, in Davar, 2 May 1952).